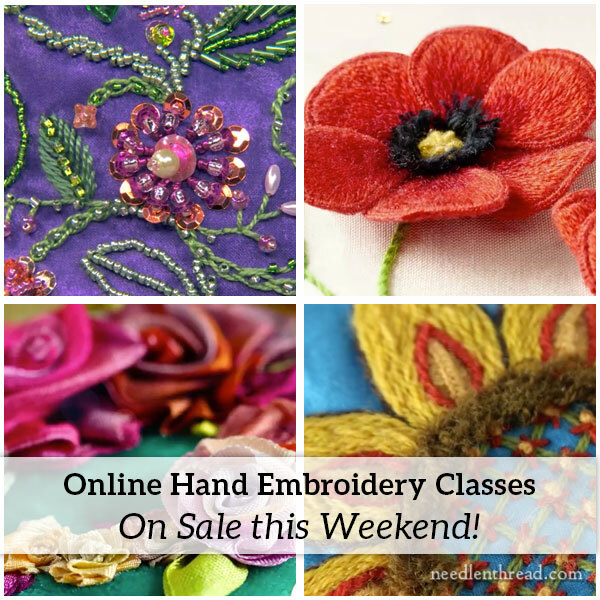 If you’re looking to explore new adventures in hand embroidery, you’ll be happy to know that all of Craftsy’s online classes are on sale for less than $20 this weekend, and that includes a nice line-up of hand-embroidery related classes! I’ve gotten my claws into two new-to-me Craftsy classes, too. As the end of the year approaches, I’m a little antsy to follow through on one of my new year’s resolutions for 2016, which was to learn a new handwork technique. I’ll tell you about it below! In the meantime, here’s a list of super-good hand embroidery classes available on Craftsy (along with links to my reviews) that are on sale this weekend for less than $20. If you’re keen to learn a new technique or brush up on your stitching skills before the end of the year, this is a great way to do it! Online classes are affordable. You’re not paying for travel, for lodging, for food, or for daily tuition. They’re a great way to brush up on, or expand, your skills. They don’t expire, so you can work at your own pace. They include quality video instruction. They include instructor interaction and feedback. And they are taught by quality instructors who really know what they’re doing! Craftsy offers well over 1,100 online classes in all kinds of arts and crafts. Out of all eleven-hundred-and-something classes that they offer, a whopping nine are hand-embroidery related. Even though the number of offerings is low, those classes pack a good punch! You can learn a lot in each of them! Here’s the list hand-embroidery related classes on sale through this weekend, with links to my reviews of some of them, if you want to read about them in more detail. 1. Goldwork Embroidery: Essential Techniques – this is a fantastic goldwork class taught by Lucy Barter, RSN graduate. If you’re wanting to learn about goldwork embroidery, this is a really affordable way to learn the essentials! You can read my in-depth review of the class here. 2. Stumpwork: Raised Embroidery Essentials – Another super-dee-duper class! These first two classes especially are the types of classes you’d pay Big Bucks for at a needlework convention. They are both taught by world-renowned instructors, and they are both thorough introductions to the techniques. Celeste Chalasani’s stumpwork class is quite amazing! You can read my in-depth review of it here. 3. Stitch It with Wool – Lots of colorful and exciting stitching techniques for wool embroidery! If you haven’t ventured into embroidery with wool, but you’re thinking about it, this is a great taster course that will get you going. 4. Embroidering with Ribbon – There are few types of embroidery that make a huge impact with relatively few stitches, and ribbon embroidery is one of them. Whether you want decorate crazy quilts with ribbon embroidery or make full ribbon embroidered masterpieces, this class is a great place to start. I’ve always through that ribbon work is one of those techniques that’s definitely easier to learn when you can watch someone proficient at it. This class is an excellent place to do that! 5. Design It, Stitch It – a nice introduce to hand embroidery in general and all the basic stitches! If you’re a flat-out beginner, or if you have a couple stitches under your belt and don’t know what to do next, this is a good place to start. 6. Embroidering Texture & Dimension by Hand – This class is a fun one if you like the idea of embroidering and appliqué with felted wool, especially. You’ll learn all kinds of dimensional and textural stitches, too, and how to build up layers to create dimensional pieces. It’s a fun and colorful class! 7. Crazy Quilting with Allie – Are you enchanted by the freedom and exuberance of crazy quilting, but don’t quite know how to start? This is the place! Allie Aller – author of several excellent books on crazy quilting – will take you step-by-step through creating your own blocks and embellishing them! 8. Bead Embroidery – An excellent introduction to incorporating beads into embroidery! You can read my in-depth review here. 9. Bead Embroidery: Beyond the Basics – and another excellent class for adding beadwork to embroidery, this one goes into Heavy Duty beading techniques. It’s great! Everything you wanted to know about beadwork…and then some! I’m taking two classes through Craftsy right now – Shuttle Tatting and Next Steps in Shuttle Tatting. I’ve always wanted to learn shuttle tatting. When I was in college, there was a gal who used to walk through my dorm, trailing behind her a never-ending line of shuttle tatted lace, and her fingers flew while she made the stuff. It mesmerized me. I tried to teach myself from a book once upon a time, but I never got anywhere. I think it’s one of those things that’s best learned by watching someone! What I like about the classes so far: it’s not just tatted doilies! The classes focus more on little motifs. Think: decorating greeting cards or crazy quilts, and for making jewelry – all kinds of stuff beyond the tatted doily! She covers adding beads to tatting, reading patterns…it’s just good coverage. The classes are quite slow, which, for me, is a good thing. But if I want to, I can always fast forward! And so I’m fulfilling one of my new year’s resolutions (better late than never!) by learning to shuttle tat. It’s fun! Well, as far as I’ve gotten with it, anyway. I’m very, very, very slooooooooow. It’s a good time to take advantage of the sale prices on Craftsy and learn something new! Through the weekend, all online classes are less than $20 – they range anywhere from $14.99 to $19.99. Hope to see you over there in some of the classrooms! PS. I use affiliate links for Craftsy, so I do get a wee kickback for class sales when you go through my links. I’d recommend them, regardless – but every penny counts to help keep Needle ‘n Thread going! June 15, 2013 Online Crazy Quilting Class with Allie! I wish you would teach a class! So many of Craftsy’s classes are beginner or intermediate, so it would be really nice to have an advanced class taught by you. Sorry I pressed the wrong button by mistake when I was issuing my warning. I was going to say that tatting is addictive!! Once you get a ring to close you are are on your way. Keep taking it slow and it will get faster by itself. My grandmother taught me to shuttle tat and I still like to do it. At least I had the basics when I wanted to take it up again. Good luck on your new venture. Hi Mary! Thanks for the heads up on all of these great classes! Much appreciated! Hi, Karen – Yes, I’ve done a bit of needle tatting. Needle tatting has always made a lot more sense to me for some reason, and I find it relatively easy. But I thought I should at least try to get the basics of shuttle tatting down, because it’s always fascinated me. I’m not as good at it. It might be the “embroiderer” side of me that just prefers working with needles! Mary, there is a Yahoo Group that holds regular classes on tatting for beginners. The name for the group is “New Shuttles and Needles”. They are a very good group, and don’t mind helping you troubleshoot “situations” as they arise. There is a more advanced group out there too. I tried to teach myself to shuttle tat from a book once 16+ years ago…couldn’t figure a darn thing out beyond how to load up the bobbin. I still have the 2 balls of thread, shuttle (and teeny tiny crochet hooks?) sitting in the bottom of a bin. I’ve been using the thread to make friendship bracelets/kumihimo braids occasionally instead. Hope the video classes work better than books. I taught myself basic shuttle tatting long ago from a booklet, but then wandered of to other things. One thing I was never able to get was 2 shuttle tatting. I got a tatting shuttle mixed in with a bunch of threads at my thrift store awhile back. It is a technique I never understood but was pleased to get the shuttle in case I ever want to try it (and have the time). Please let us know how the class worked for you. As to lack of time, you might want to do a blog post on how you have time for what you do especially after what all you have had to do this year, which in that regard, I hope you are feeling good at this point. … and many feet of lace. I tried to learn several times and understand the basics, but got stuck at the knots. You must persevere! Lol Now I just place my orders and he fills them. If you get stuck he said he would be happy to help you. Darn it! Now I have a list ………………..Good luck with your tatting, it is a very amazing craft. It took me over 2 years to learn how to shuttle tat. Gave up on the shuttle and took up needle tatting first then after learning the skill and understanding the process, I resumed learning the shuttle. Now I do both and love it. I’ve also signed up for those tatting classes! I’ve got myself the supplies and am trying it, though I’m finding it hard to get the knack. I’ll keep trying though, as I think it will be a very portable craft once I get the feel for it. I also like the focus on motifs rather than doilies. So many classes Craftsy offers and at reasonable costs. I never heard of Shuttle Tatting I just looked it up and it looks really interesting if I wasn’t in throws of a couple of projects I have to finish I might have joined you. I’m going to browse through their courses and find one that might interest me for future reference. Thanks for sharing the Craftsy on-line courses with us and good luck with your Shuttle Tatting I can’t wait to follow your progress. I bought the shuttle tatting class. I tried it out a while ago but i’m really struggling with it! Pam Holland is a n amazing artist, I think mostly machine work. I was able to attend an exhibition of her work last year at the Australion Machine Quilting Convention in Adelaide South Australia. Oops…just watched the video of the thread painting and it’s machine embroidery, not hand embroidery! Oh well, never mind…gorgeous non the less. I have wanted to learn tatting and have my Grandmothers shuttle. But I purchased a tambour hook recently, so I will need to play with that first.i looked at your posts on this with interest. Go for it girl! Will be interested to see your progress. The motifs sound great, you got me at crazy quilts. Thanks for the heads up on the classes too. Trusting all is going well for you every way. It’s very slow going! I think I need to invest in heavier thread to start with – I started out with a pretty fine cordonnet, but it’s hard to see without really good light. Anyway, I’m pretty clumsy with the shuttle. I find Needle tatting much easier! Thanks for the tip, Audrey! I will look that up! I like the online class so far – Craftsy has a nice set up, especially with a class like this, where you can play a 30-second repeat and watch the harder-to-get concepts a few times over. I made the mistake of starting with a thread that’s too fine, so I’ll be “graduating” to a heavier size thread on my next go!